Hello friends! I took part in A Photo an Hour with Louise and Jane on Saturday and now I’m finally getting round to writing my blog post. It was one of those rare occasions on which I was actually doing something so 90% of my photos don’t consist of housework and the view from my couch. Hurrah! Let’s take a look at what I did, shall we? 9 a.m. Starting the day with a cuppa, as always. 10 a.m. Showered, now to decide what to wear. 11 a.m. Buying a train ticket while Jan’s in the shower. 12 noon. On a train, about to leave Basel. 2 p.m. Still on the train, passing Lake Thun. 3 p.m. We changed to a regional train at Interlaken Ost. Photo from somewhere near Brienz. 4 p.m. After three hours on the train we discovered that our detination – the Aare Gorge – was closed. Plan B: cable car up the Hasliberg. 5 p.m. After walking around the village on the mountain for a bit, we’re back in the cable car waiting to head down again. 6 p.m. Reading a book, waiting for the train to leave Meiringen. 7 p.m. On another train, stopped at Thun station. 8 p.m. Still on the train. At least I’ve had plenty of time to read my book! 9 p.m. On the tram home after stopping off to buy a few bits. 10 p.m. Food! There were scrambled eggs as well but I had eaten them all by photo time. After taking the final photo, I finished my dinner, read the last few pages of the book (in time to return it to the friend who lent it to me the following day) and was in bed before 11. Next photo an hour is on Saturday, 27th April 2019 if anyone feels like joining in. Simply take one photo every hour and post to Twitter or Instagram using the #photoanhour hash tag or save your photos and write a blog post afterwards. First Friday letters of 2016! I’ve been totally slacking on the Friday letters front so far this year (and the blogging front in general, to be honest). I have some letters in mind now, though, so let’s do this! Dear British celebrities. Apparently the Grim Reaper has it in for you lately. Please look after yourselves! (Especially if you happen to be approaching 69). Dear 2016. I’m hoping for great things from you. Don’t let me down! Dear snow. You are on your way, apparently.Please could you hold off just until I get back to Basel tonight? I don’t fancy being stranded on a train, thanks. Dear January. You’re half over already! This scares me. Dear Dylan Moran. I’m hoping you still have tickets left for your show in Basel at the end of the month, because I really want to purchase some! Dear fellow bloggers. I promise to come and catch up with your soooon! Guys… this is my final Friday letters post for January. How did that happen?! I’m kind of freaking out right now because it’s February on Sunday and we still don’t even know what country we’ll be moving to. And Jan may or may not be spending Monday-Thursday in Munich for most of Feburary. The good news is the tax advisors got back to us. The bad news is they didn’t have all the answers, so now we have to contact the Ausländeramt (foreigners registration office) in Basel and some people who know about insurance. Ugh, so much to sort out, so little time! Anyway… letters! Dear train conductor. If we haven’t even entered the tunnel yet, we will not be reaching our destination in a few minutes. Shut up and let me sleep! Dear weather. I can cope with cold, I can cope with rain, but does it really have to be a mixture of both plus wind to blow it all in my face?! Dear spare room. You currently look like you’ve been hit by a hurricane. I promise to do something about that this weekend! Dear shredder. I hope you’re prepared for some action – I shall have lots of papers for you when I’m done with the spare room! Dear readers. I hope your weekends are more relaxing than mine is shaping up to be! Happy Friday, everyone. Have a great weekend! I prefer my cheese on my plate, thanks very much! My train home from work is one of the main commuter trains and accordingly is always full. Most days, I don’t even bother looking for a seat – mine is the next stop and by the time I find somewhere to sit, it’s usually time to get up again. So usually I wait until everybody else has got on and the doors have closed then perch myself on the step. It’s not the most comfortable positions, but for 20 minutes I can deal with it. Yes, you sometimes get a wet arse if it’s raining – but it’s okay, my coat’s waterproof. Yes, the step is cold and pretty hard – numb bum central! But I have enough padding down there to make it bearable 😉 However, there is one thing that regularly makes me wish my journey was just a little bit shorter… or it was the olden days and I could carry smelling salts around with me. It’s when another passenger comes and stands right in front of me… and I can smell their feet! Obviously not everybody is guilty of this, but when a stinky-footed person does come and stand next to me, it takes all my will power not to ask them to move. Dear train travellers, if you think your feet may be a bit whiffy please don’t shove them under the nose of some poor, unsuspecting person sitting on the floor! (In case you were wondering, this happened to me just yesterday… hence the post). This morning, I got up expecting life to return to normal after my unusually full weekend. Before leaving the house, I quickly checked the Internet to see whether my train was on time. “Warning,” said the Deutsche Bahn website. “Due to strikes, trains in Baden-Württemberg may be subject to delays or cancellations.” My train, it transpired, was delayed by 110 minutes (Deutsche Bahn don’t seem to believe in hours…). And the next train I could have taken was cancelled. The regional trains were apparantly running as normal though. So I sat back down for a bit before heading out to catch a regional train. I arrived on the platform to find that the train was not already there. This is unusual – it leaves 10 minutes after my usual train but is normally already sitting there 5 or 10 minutes before mine even arrives. Today, there was no sign of it although the information board mentioned nothing about I delay. I waited, along with a number of other people, but the train never came. Then we noticed another train with the same destination sitting on a different platform. So off we went to platform 5. The train driver was standing looking out of the window, so we asked him whether his train would be going to where we wanted to be. “Yes, at some point,” he replied. It was 5 minutes to 8 at this point, and he informed us that his train was actually the 6:55 one but he hadn’t been given permission to leave yet, so he’d been sitting there for two hours waiting for something to happen. A few people got into the train anyway, but I chose to head home and spend theday working from there. Luckily I have the option to connect to work remotely! I managed to spontaneously get a doctor’s appointment today (spontaneous because, although I emailed him last week, the doctor only wrote back to me last night and I didn’t see the message til I was at work this morning), so I had to leave an hour early than I had intended to catch the train back to Karlsruhe. For about 45 minutes, I kept an eye on the Deutsche Bahn website, watching my train arrive at and leave each stop along its route punctually. By the time I had to leave, the train was at the station before mine, but still on time and preparing to leave. So everything was hunky dory, or so I thought! Arriving at the train station pretty early, I decided to treat myself to some chocolate before heading to the platform (don’t look at my like that, I know you would too!). 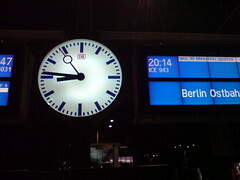 Once on the platform, I saw that my train was displayed on the board with no extra messages. Woo hoo! 4:24 p.m. then arrived, the time the train was meant to arrive, but no train to be seen. Still, I wasn’t worried this particular train hangs around for 8 minutes so it still had plenty of time to catch up. Down ticked the minutes, and still no train until finally, two miutes before it was supposed to leave, the display was suddenly updated. “Approximate delay 10 minutes”. Right, a 10 minute delay. That would leave me 20 minutes to get from Karlsruhe train station to the doctor’s surgery. It mightbe possible, if I could get a tram straight away. Hmm, dountful. Then the thought struck me that there was another train due to leave for Karlsruhe shortly after mine. Relief! I dashed off to the other platform with four minutes to spare only to find – have you guessed it yet? Yep, that one was also delayed. By ten minutes. So back to the original platform I went, where the delay had now gone up to 15 minutes. Chances of making it to the doctor’s on time with either train? Zero!